ACER got a few things right and much wrong with the Predator (specifically, model AG3620-UR12). With a 3.4GHz Core i7-3770 CPU (one of Intel's better processors) and 32GB of DDR3-1600 memory, its asking price of $1299 is very reasonable. But it also has an AMD Radeon HD 8760 video card (the OEM version of the milquetoast Radeon HD 7770), a chintzy custom motherboard with just one PCIe xl6 slot (occupied), and a minuscule 16GB SSD that serves as a cache to the 2TB, 7200-rpm mechanical hard drive. Three doors in its face flip down to reveal 5.25-inch drive bays. One is occupied by a 16X DVD burner, and a second has a slide-out tray with SATA power and data connectors in the rear. This isn't a hot-swappable bay, but it provides an opportunity for data backup you can remove. It also has two empty 3.5-inch drive bays, accessible only from inside the case. A media-card reader, two USB 3.0 ports, and two USB 2.0 ports are on the top of the case. Six more ports — two USB 3.0 and four USB 2.0 — are in back. The video card has DVI, HDMI, and full-size DisplayPort connectors (one each), plus antennas for a wireless network adapter card (802.11b/g/n). 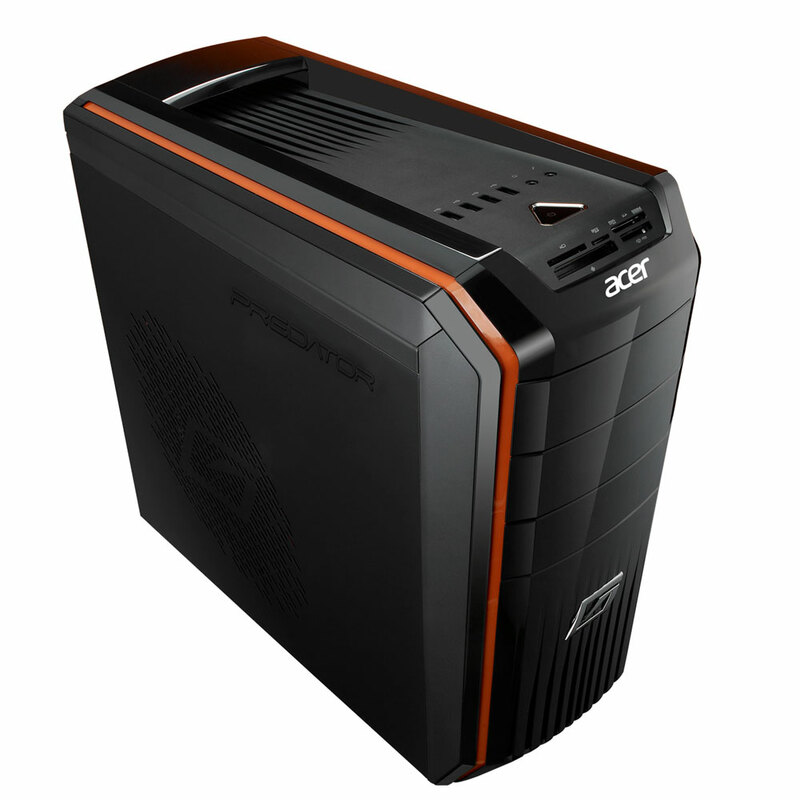 Acer pitches this machine as a gaming rig, but hard-core gamers will find it to be weak tea. Otherwise, the Predator is a better than average family PC. Really good review! It looks like AMD has another solid APU on its hands, all things considered. I want to start this off by saying I love the computer as it is now, however when I set up the computer and turned it on for the first time it immediately went to the blue screen of death because Acer did not correctly install Windows 8. After paying for the dvd to fix this issue (which I find ridiculous) and an overnight shipping charge to get it here quickly the computer is running smoothly and I am happy with it. As far as performance wise: I purchased this computer to use for gaming, the graphics are on point with no lagging, it is everything I was expecting and looking for. I will also say Windows 8 is much nicer than I imagined it would be from all the "I hate windows 8" postings you see everywhere. I noticed that I am not the first person to run into the windows installed incorrectly issue, so be forewarned that it seems to be a common problem.